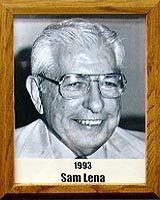 During 13 years as a Pima County Supervisor (chairman, 8 years), Sam Lena was a strong supporter of the Parks and Recreation Department, helping to obtain and improve parks and sports facilities throughout the county. Later, as a member of Gov. Rose Mofford’s staff, he was instrumental in bringing major league spring training teams to Tucson. Sam also supported the Cactus League, participated in bringing the Colorado Rockies to Tucson, and supported (and was a member of) the Pima County Sports Authority. Sam served twice in the Arizona House and four terms in the State Senate where he worked tirelessly on health care and mental health issues. No stranger to the playing field, Sam excelled in track and field and fast-pitch softball at Thomas Jefferson High School in Port Arthur, Texas (1937-39). He played on a two-time championship team in the S.E. Texas Catholic Youth League and pitched four no-hitters. With the Tucson Fast-Pitch Softball City League (1945-55), he racked up five more no-hitters for the BPOE (Elks) and coached the team for two years. Sam officiated and coached Little League for four years at St. Ambrose School and helped organized the Special Olympics League where he coached track events.